Hey Boy, you’re driving wild, slow down and pull over. If you don’t pay attention you’ll pass this love right over. Though Saundra Williams and Starr Duncan Lowe grew up mere blocks from each other in New York City’s South Bronx, it would be many years before they were destined to meet. Both had been singing since they were very young. Starr had her start in church and on Broadway at the tender age of 6; Saun, in church at age 7. By the mid-80’s, many of the choir members they sang with began going to open mics to perform. It was through this mutual circle of friends, that they both found themselves at the same open mic night at a Harlem club called, Carl’s Off the Corner on 145th and Broadway. It was a Thursday night in the fall of 1986. Each took a turn at the mic, delivering a performance that would leave a lasting impression on the other. After Starr’s performance of “My Funny Valentine” (a bold selection for an open mic singer,) Saun introduced herself. Forged in a mutual respect for each other’s talent and a shared musical aesthetic, it would prove to be a beautiful friendship that would last for years. Saun and Starr each struggled over the years to maintain consistent work as singers, so they were no strangers to also working full time jobs, to make ends meet. Starr attended Music and Art High School and had some success on Broadway as a child, all of which would lend connections that would help her later in her career. In 1990, Saun was a four-time winner on the famed and televised Showtime at The Apollo talent show and led her first band, ‘Saundra Williams and The Force’ on a tour in Yokohama, Japan. Also during that time, they began performing with a local singer named Nick Jones, whose frequent performances at the Apollo and local nightclubs kept them busy for the next few years. Both were living in New Jersey sometime after those gigs ended, when Saundra went to audition for a successful wedding band whose lead singer happened to be none other than Miss Sharon Jones. Unbeknownst to Saundra, her old friend Starr was also vying for the position. The chemistry between the three singers was instant and undeniable and after a brief meeting with the band, both Saundra and Starr were hired to sing lead alongside Sharon. The ladies performed with the group under the apt moniker, ‘The Good ‘N Plenty Girls’ (though within the group, they were given the nickname, ‘Triple S Threat’) for much of the 1990’s. Over the next several years, each would leave the wedding band in their own time. Sharon would hook up with Desco and then Daptone Records to launch her well-documented solo career, Starr was enjoying touring with the gospel groups Glory Gospel Singers and Sister Act, and Saun was working steadily with dozens of other bands throughout NYC, touring/recording with music artists from Meli'sa Morgan to The Victor Wooten Band and writing in her spare time. In 1999 Saundra released a solo album, Bless the Day. 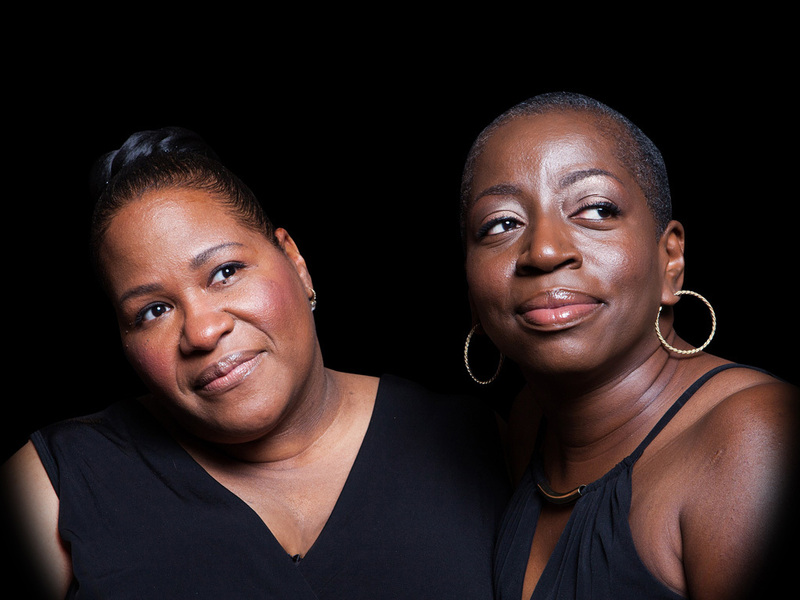 Though the three women kept in touch in some form or another throughout the 2000’s, it wasn’t until the release of Sharon Jones & the Dap-Kings’ 2008 album, I Learned the Hard Way, that Sharon put the call out to her old friends and the three joined vocal forces again. To begin with, it was just a call for a special performance at the Best Buy Theater in New York City, but after the band got a taste for how much the background vocals elevated their show, Saun and Starr soon began to get more regular calls. Within a few months, they were performing regularly as Sharon’s backup singers. Saun and Starr quickly acclimated to the group and were re-christened as The Dapettes. They quickly became a permanent part of the Daptone Family - a move that would revitalize their careers. Over the next few years of extensive touring, the band began showcasing the Dapettes by featuring them on a couple cover tunes at the top of sets. 2013 brought the release of SJDK’s sixth long player, Give the People What They Want, which would feature extensive studio recordings of the Dapettes on background vocals (often including a mysterious third harmony by a “Miss Lafaye Jones.”) Poised to make an obvious step to the front of the stage, cover songs soon gave way to original compositions and the duo was now being announced as Saun & Starr. Each singer had the talent and personality to carry a solo career in their own right but Daptone’s vision for them would be as a dynamic duo, capitalizing on the rare chemistry between the two women which could create a sound stronger together than apart. Before long, they joined The Dap-Kings at Daptone Records’ House of Soul to begin recording an album of their own material. The first single from this session, “Hot Shot” – penned by Daptone’s head honcho and producer extraordinaire, Gabe Roth, and saxophonist Cheme Gastelum – was instantly Daptone’s best selling 45 to date. Saun & Starr’s debut album Look Closer has come together as one of the Daptone Family’s proudest studio endeavors. Its Spring 2015 release, fully supported by touring and promotion, is highly anticipated by fans and musicians alike. Their hopes for 2015 are to realize some personal dreams of their own, to live in a stable place, and continually be self-sufficient working musicians. Musically, they strive to make great music that people will love to listen to for a long, long time and to inspire others to follow their dreams. When the ladies are on tour, their priorities are to show their audience love by always remembering and respecting the journey that has brought them to each stage and to represent the music of Daptone with the grace, energy and quality that they are known for.